Share the post "Vietnamese Spring Rolls"
Looking for a fun and unique dinner idea? 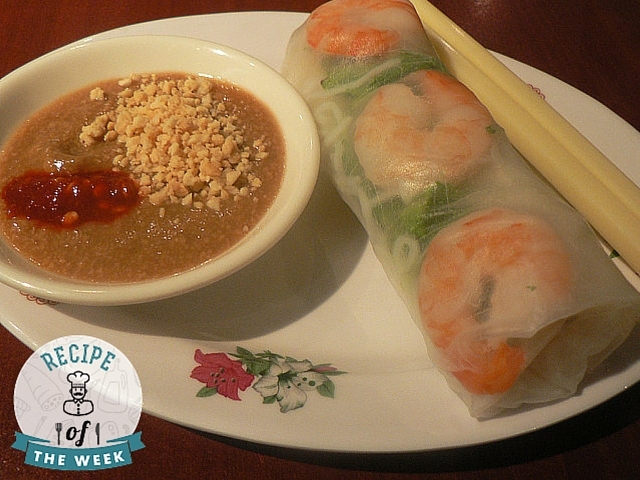 Vietnamese spring rolls are easy to make and add a different spin on a weeknight dinner. Feel free to use other ingredients that you have on hand, such as chicken, peanuts, cucumbers…whatever! Set out a large bowl of warm water. One at a time, carefully dip the entire rice paper wrapper in the water until it becomes malleable (about 1 minute). Lay the wrapper flat on a plate. Working quickly, place the ingredients on the wrapper: 4 mint leaves, 4 shrimp halves, a lettuce leaf, a handful of vermicelli, and a handful of bean sprouts. Add another lettuce leaf or mint, if desired. You want to make sure to leave about 2 inches of free space along the perimeter of the wrapper. Now fold the 2 sides of the wrapper into the center; starting at the bottom, roll the wrapper up like a burrito. Repeat this process for the remaining wrappers and ingredients. To make the dipping sauce, pour the rice vinegar, fish sauce, water, and sugar into a saucepan and heat on high (until sugar dissolves). Let cool; add garlic and carrots, if desired. Sauce keeps in the refrigerator for 7 days. Place summer rolls on a serving dish along with the dipping sauce. Enjoy!